Summerland Steam beat Revelstoke Grizzlies 5-2 in game with 255 penalty minutes handed out. A line brawl breaks out at 8:06 of the second period during Saturday’s game. The Revelstoke Grizzlies didn’t get the result they wanted against the Summerland Steam on Saturday, but it wasn’t for lack off effort. The Steam rolled into town on Saturday and toppled the Grizzlies 5-2 in a rowdy game that was punctuated by a line brawl midway through the second period. Summerland had the edge in the first half of the game, getting first period goals from Calvin Rout and Riley Pettitt to jump out to a 2-0 lead. Rout scored his second goal two minutes into the second period to put the Steam up 3-0. It took a while for the Grizzlies to get going, and they struggled to connect passes and generate offence throughout the first half of the game. Things changed when a brawl broke out between the two teams. While it’s unclear how it started, the end result was four Grizzlies players and three Steam players getting kicked out of the game, and the ref handing out 157 penalty minutes. 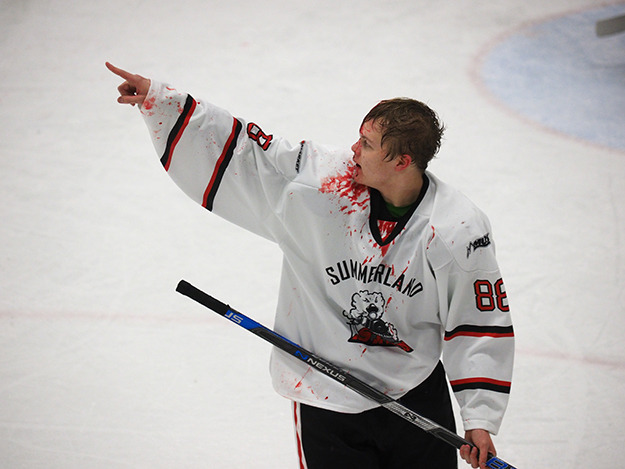 Photo: Summerland’s Konsta Jaske leaves the ice bloodied following the second period brawl. For Summerland, Konsta Jaske and Riley Pettitt each received two game misconducts and five-minute penalties for fighting, while Andrew York received one game misconduct and five minutes for fighting, and Ben Dietrich-Scammel was penalized for interference. On Revelstoke’s side, Kael Norman, Matthew Monk and Fraser McMann received fighting majors and double game misconducts, while Dace Norman received a fighting major and a game misconduct. There was more rough play as the game went on. On the scoreboard, Raphael Bassot got Revelstoke’s first goal with just under two minutes left in the first period with an assist from Tyler Chavez Leech. Braden Eliuk scored for Summerland at 13:05 of the third to restore their three goal lead. Revelstoke pressed to tie, pulling their goalie with 7:13 left to take advantage of a power play opportunity. The bold move did pay off when Jon Van Der Molen scored to make it 4-2 with with just under five minutes to play, however Summerland would pot an empty netter with 1:41 to go to cement their 5-2 victory. A total of 255 penalty minutes were handed out during the game, including 136 to the Grizzlies. 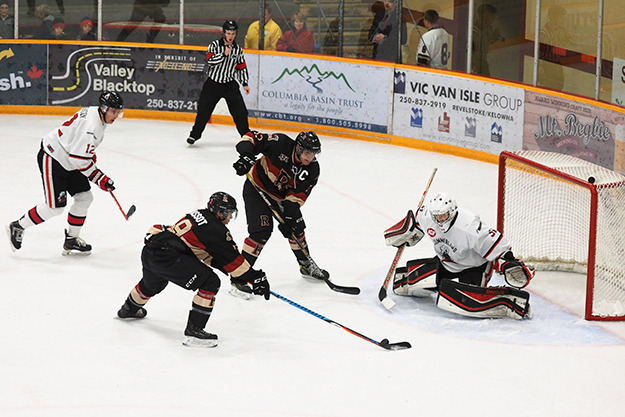 Photo: Tyler Chavez Leech sets up Raphael Bassot for the Revelstoke Grizzlies first goal. After, Chavez Leech, playing his first game for the Grizzlies after a season in Junior A, said he felt the game was closer than the score indicated. Chavez Leech, who led the 2014-15 Grizzlies in goals, returned to the team for his 20-year-old season after playing in Saskatchewan last year. He made his presence felt, generating a few scoring chances and one big open ice hit. He will be splitting the captain’s duties with Michael Lenoury. The hulking forward said he was happy to be back in Revelstoke where he started his junior career. The Grizzlies are on the road this weekend, facing the Kelowna Chiefs on Friday, Oct. 21, and the Chase Heat on Saturday, Oct. 22. It’s the first two games of seven straight on the road. The Grizzlies don’t play at home again until Remembrance Day. “We’re in for a bit of a grind and we’re going to be up for it,” said Parent.